MANANG, Oct 28: Like other tourist destinations of Nepal, the Annapurna foot trail is busy welcoming a large number of visitors this year. From small lodges to star-rated hotels, the properties along the trail are packed with visitors this tourist season. Tourism entrepreneurs in the Annapurna circuit expect to welcome the highest number of tourists this year compared to the previous years. According to data compiled by Tourist Information Management System (TIMS) checking office located at Besi Sahar, 19,259 tourists entered the Annapurna foot trail till the third week of October. In 2017, a total of 21,345 visitors visited Annapurna foot trail in the entire year. The figures were 17,870 in 2016 for the entire year, 11,069 in 2015, and 16,812 in 2014, according to Nanda Raj Bhatta, chief of the TIMS office. Although visitors can reach upper Manang in one day via motorway, it takes at least six days to reach there on foot passing through Besi Sahar. They have to stay the first night at Ngadi or Chyamche, and subsequent nights at Talgaun, Dharapani, Chame, Pisang, Humde Manang and Khangsaar to reach upper Manang. From Khangsaar visitors either go to Tilicho Lake or Thorangla Bhanjyang. During this season, hotel owners are so busy serving their visitors that they even find it hard to chat with friends. Binod Gurung, president of Manang Hotel Entrepreneurs Association, the number of tourist arrival this year is the highest of the past five years. Around 100 hotels from Besi Sahar to Khangsaar have full occupancy at the present moment. Gurung’s hotel, with a capacity of 40 visitors, is always packed with visitors in this season. January to April and October to November are considered suitable seasons for trekking. During these months, both foreign and domestic tourists come to Annapurna foot trail for trekking. According to trekkers’ record compiled by TIMS office Besi Sahar, every day 200 trekkers are coming to Annapurna foot trail this year. Along with foreigners, domestic tourists are visiting the foot trail in equally high numbers. “Increasing number of domestic tourist has boosted crowd on the foot trail,” said Nabin Gurung, owner of Hotel Royal Mountain. Generally, trekkers pass through Annapurna foot trail to visit Chame, Upper Manang, Thorongla Bhanjyang, Jomsom, and Muktinath temple. 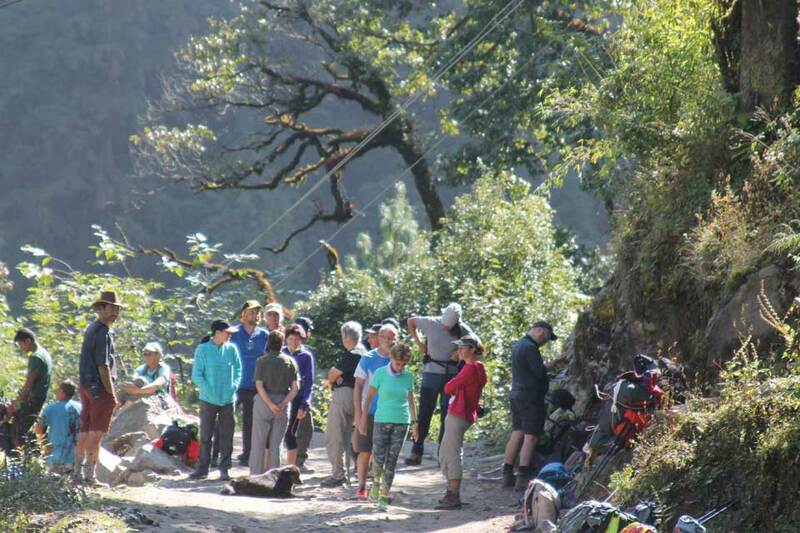 Foreign tourists start trek before the Dashain festival, the number of domestic tourists is also increasing. “Domestic visitors start coming soon after Dashain,” said Basu Thapa, a hotelier from Manang. “Normally hotels are crowded during this season but this year hotels are finding it hard to serve the huge number of visitors,” he said, adding that the number of domestic tourists has increased this year.